THIS is what booklovers' dreams are made of. Floor to ceiling bookcases crammed to their limits, books piled on the floor, a comfortable atmosphere where one could browse in peace for hours, and not just the standard supermarket rack paperbacks, but quality stuff. I had barely taken two steps inside when I found the first book I wanted. Amazing how quickly one’s resolve melts… I tucked it under my arm and continued exploring. 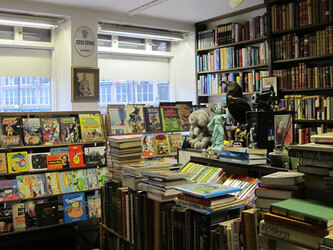 A large and colorful selection of comics and graphic novels filled much of one wall in the first room. There were sections with novels, crime stories, sci-fi and fantasy, outdoor and wildlife, cooking, psychology, art, history, you name it. Many of the titles were in English and other languages, so even if you don’t speak Finnish, this shop is worth stepping into! There is even a small room in the back filled with DVDs. I like places that have a history, so the fact that books have been sold at this location ever since the building was erected (late 1920’s) only made me appreciate it more. 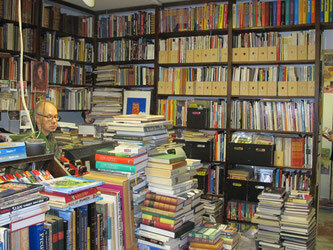 The owner, Timo Surojegin, said that he’s owned this shop for the past 30 years! He estimated that he has about 40,000 books in stock (and yes, sheer quantity in an antiquarian bookstore does make your heart beat faster, just because you know you’ll find something you want there!) 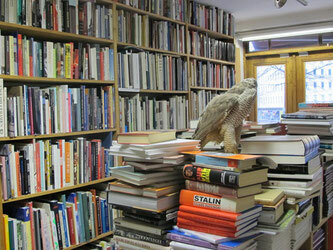 Since Timo is interested in art and history, these sections of the bookshop are especially well-stocked (here also were many English language books to be seen at first glance). He places weight on good-quality non-fiction. Prices at Kampintorin Antikvariaatti are reasonable, and there was a constant coming and going of customers; some knew exactly what they wanted, others browsed intently. Booklovers travelling to Helsinki should definitely take the time to visit – I dare you to step inside and tell me the place doesn’t exude promises of finds to be made! Kampintorin Antikvariaatti also offers online services. A quick walk to two other antiquarian bookshops followed, but I only pressed my nose against the glass, inspected their window displays, and tried to peer as far inside as I could. I didn’t dare walk inside for fear of missing my flight back to Hamburg. For those in - or visiting - Helsinki, I’d also recommend Alexei Svetlov’s exhibition at Artegrafica (Museokatu 3). He’s turned buildings in Helsinki into fantastic paintings! But hurry, the exhibition ends on December 17, 2017. Many thanks to Markus for the tip! 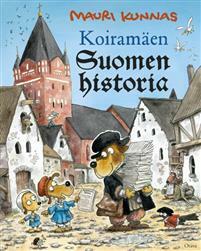 This is Koiramäen Suomen Historia by Mauri Kunnas, which I mentioned above.